You are here: Home / Travel / 10 Places to Visit in Hocking Hills! Discover Ohio! 10 Places to Visit in Hocking Hills! Discover Ohio! 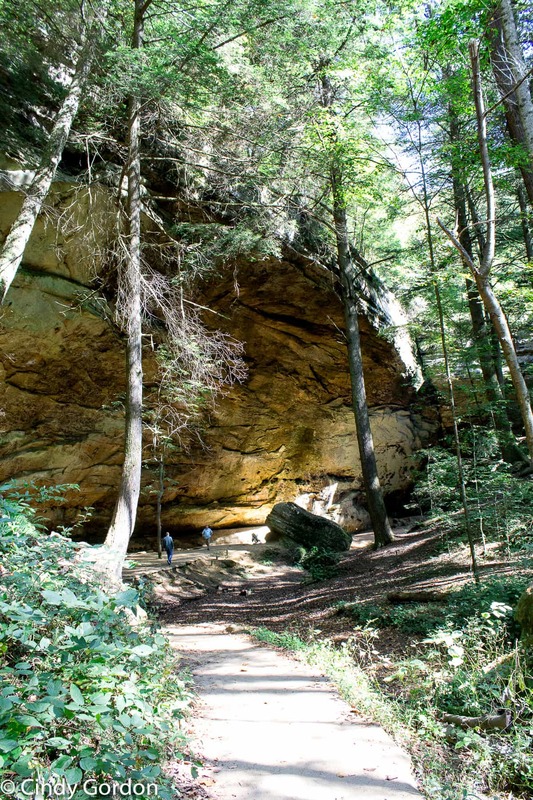 Discover Ohio and our 10 favorite things to visit in Hocking Hills! Just southeast of Columbus, Ohio is a beautiful region in the foothills of the Appalachian mountains called Hocking Hills. Just southeast of Columbus, Ohio is a beautiful region in the foothills of the Appalachian mountains called Hocking Hills. The region is rather large and is an entire county full of gorgeous state parks to hike and explore. 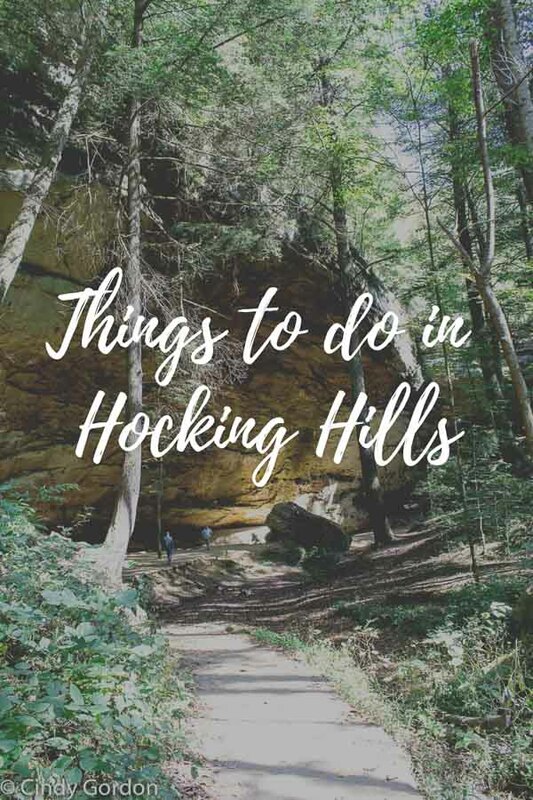 Hocking Hills is my favorite place to commune with nature, and I want to share some of my favorite family-friendly places to visit while I’m there. In my opinion, it’s one of the most beautiful places in Ohio. The hiking in Hocking Hills is amazing, and within the Hocking Hills state park there are over 30 miles of marked trails to explore. There is something for everyone here, from casual walkers to athletic hikers. Ash Cave is a paved trail that is wheelchair, stroller, and leashed-pet friendly. This trail includes pretty waterfalls, huge, towering hemlock trees, and a recessed cave to explore. Open all year round, the trail is beautiful no matter what season it is. Cedar Falls trail is described as a “wild and secluded, but spectacularly beautiful” place. It may be one of the most enjoyable hikes there. The 40-minute trail is popular with winter hikers and boasts large, moss-covered rock formations and one of the largest waterfalls in the park. 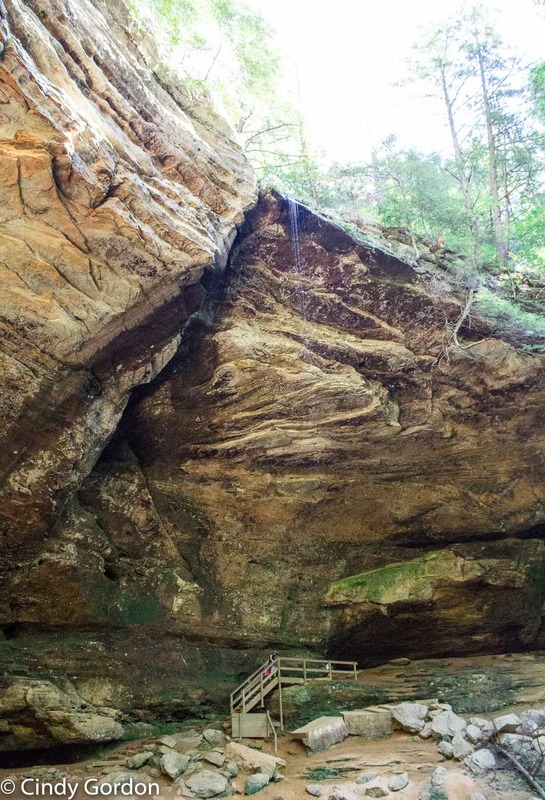 Old Man’s Cave is a 1-mile rugged hike through the middle of the gorge. It includes tunnels, bridges, and more amazing waterfalls and rock formations. Conkle’s Hollow is yet another beautiful hiking spot, and this one has two options. The lower trail is an easier hike and suitable for children, while the upper trail is at the top of some tall cliffs and is a more dangerous adventure. *Pets are not allowed in this part of the park as it is a Nature Preserve. Cantwell Cliffs is a moderately difficult hike with deep valleys and cliffs, as well as some tight squeezes. It’s worth it to see the gorgeous views though. Rockhouse is situated halfway up a 150 foot cliff. This cave is said to have been a hideout for criminals in years past and it’s amazing to imagine people living in this place. This trail is fairly difficult, and children must be carefully supervised near the cliffs. 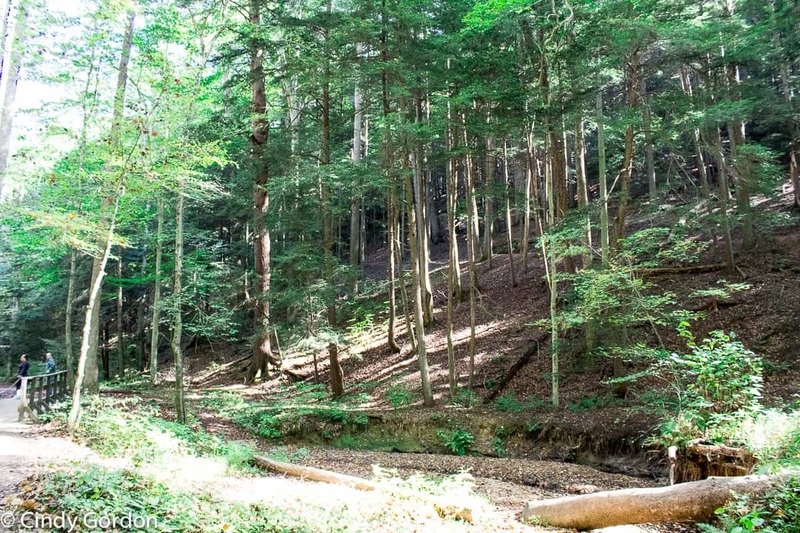 The Hemlock Bridge Trail is the newest trail in the park system in Hocking Hills. A swinging bridge gives it the name, and visitors won’t be disappointed with the views along the trail. When you’ve had enough hiking, there are other things to do here that the whole family will love. Adventure Golf Mini Golf is one of the most beautiful miniature golf experiences you can have. Flowers, streams, and a waterfall are in the background while you putt! There is a petting zoo on site as well, a perfect way to spend an afternoon with family. If you have kids under 8 years old, the AHA! Hands on Adventure Museum is a must-visit. This play museum is a wonderful educational opportunity that everyone will enjoy. The Hocking Hills KOA will let you pan for gems or gold. This part of the KOA is open to the public, you just pay for your mining kit! Price points vary based on what you’d like to find while you’re mining. Make sure to visit this post on gluten-free places (post coming soon) to eat in Hocking Hills so that you can finish your day with a nice, hearty dinner. I’m always starving after all of the outdoor activity that Hocking Hills has to offer. If you are looking for a place to stay, I would suggest The Inn at Cedar Falls or Cedar Grove Lodging! I can’t rave enough about the things to do in Hocking Hills. From state forests to all the varying lakes, you and your family are certain to have an amazing time exploring it all. The next time that you decide to plan a family visit in Ohio, Hocking Hills needs to be on your radar. You’re certain to see towering cliffs and waterfalls and deep lakes that seem to go on for miles. Don’t forget about all the caves as well! One thing is for certain. 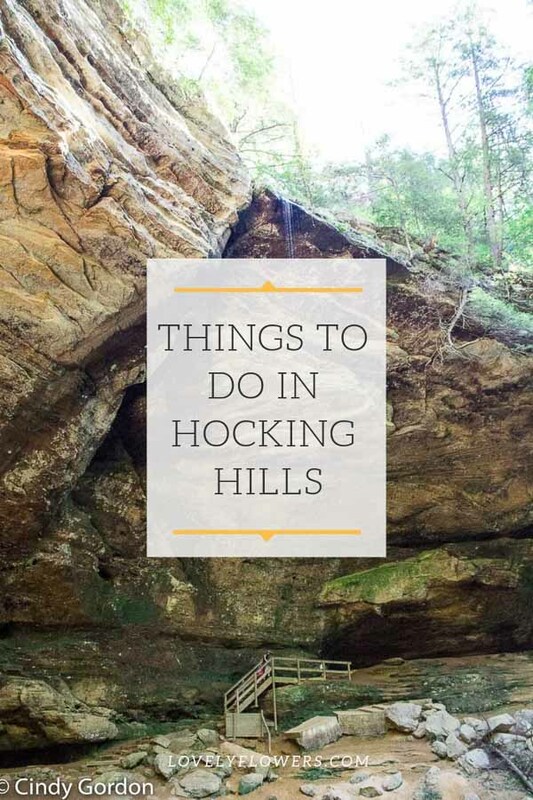 There are too many items and fun things to do in Hocking Hill that meet the eye. Plan your family-friendly vacation today! Let’s talk! Leave me a comment telling me which place you’d visit first! Or if you’ve been here, where did you go? We have been to Ohio a few times. Once was a family trip. The other two times I went on business. I have liked Ohio each time that I have gone, but I would like to visit again and head to a few of these locations. My kids like hiking and walking outside. Thanks for the tip about the adventure museum! I’d LOVE to visit the Appalachian mountains! My husbands family is from Ohio, we’re big Ohio State fans and these pics are stunning. I’d love to see the views from the cliffs. Wow! I have been to Ohio but never to a place like Hocking Hills!! Just goes to show you have to do some research to find the best places no matter where you travel. I would love to visit here! Happy to know about Hocking Hills in Ohio for my next visit there! I would have never guessed that Ohio offered such amazing adventure! I am recently getting into the whole outdoors thing lol as I went to the Poconos and feel in love with it! I would love to visit these recommendations! My husband and I loves to go on a hiking, We are an hour away to Smoky Mountain endless waterfalls and trails to hike. It feels good to be connected to nature and hiking makes me sweat so it is my work out sort of. We cross Ohio State every time we drove to up state NY but never got a chance to check their hiking area. I would love to visit this beautiful state someday. These all sound like such fun places to visit in Ohio! I would love to check out the hands-on museum, I think my son would really like that. I’ve driven through most of Ohio on our way to visit my husband’s family in Indiana, but we’ve never really had a chance to stop and explore. We came through Ohio last year and enjoyed where we did stop but this looks like a perfect spot to visit. I will add it to my travel ideas . So many beautiful places here in the US to travel to. Soemtimes I go to Ohio to visit my aunt and we set off on road trips. I’m so glad you posted this because we’ve run out of places to go! lol! Looks like there are some beautiful sights and great trails here. Lovely! We love hiking. I had an ankle injury though so I have been unable to lately. This looks like a beautiful place!